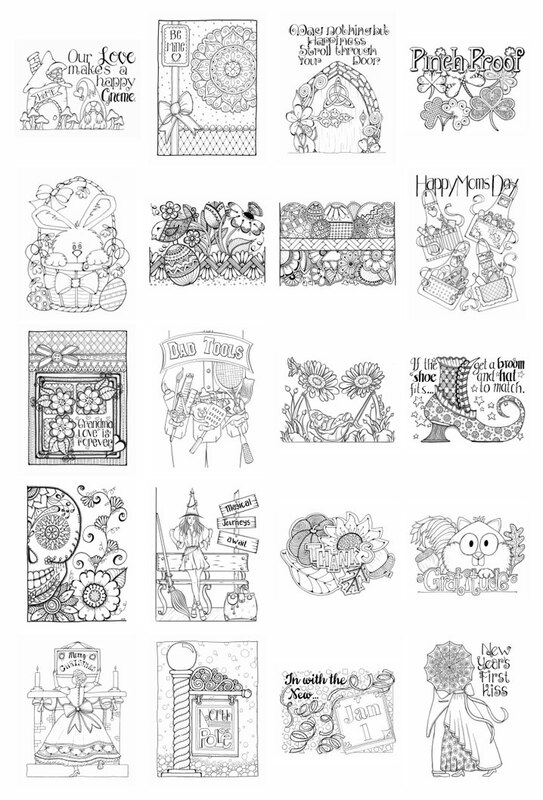 20 of my holiday coloring pages–includes most major holidays. 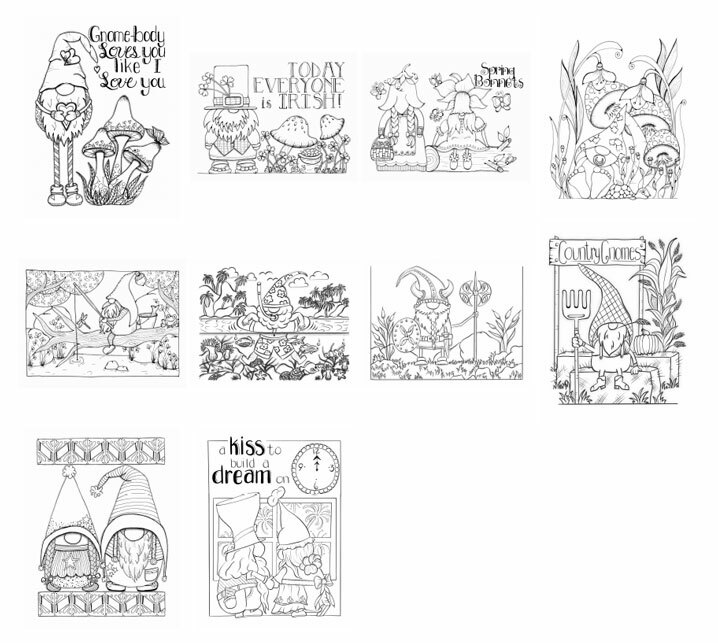 10 Gnome Bonus coloring pages–add 10 of my popular Gnome pages as a bonus. Thick, heavy, true artist quality paper–stands up to burnishing, erasing and blending. 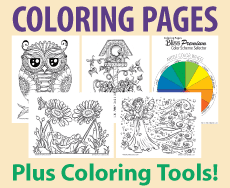 Add-Ons–choose from several add-ons to enhance your coloring book. OPTIONAL: Want to customize this book? 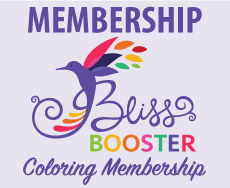 Click the “CUSTOMIZE” button to swap out coloring pages, add a special message, configure for left-handed colorists and more. Choose the paper that best fits the media you will be coloring with. If you’re unsure, I recommend Mixed-Media. Choose this paper if you will be primarily coloring with colored pencils. Choose this paper if you will be primarily coloring with markers. Choose this paper if you will be coloring with mixed media or gel pens. For only a couple of dollars, add 10 of my popular Gnome coloring pages to your book! Add even more rigidity to your coloring book with a Chipboard insert. Chipboards protect your pages from bending and make it even easier to color while holding the coloring book in your lap. Want to know what your colors will look like before you start coloring? Add a Swatching Page to your book to give you the ability to sample different colors before committing them to your coloring pages. Our Marker Paper is one of the thickest papers you can get in a coloring book, so ink bleed through is rare. However, if your coloring style includes heavy layering or you just want a little extra peace of mind, then add a Blotting Page to your order. Select this option if you do NOT want your pages bound into a book. This is a great alternative to perforation–no need to tear pages out of a book. 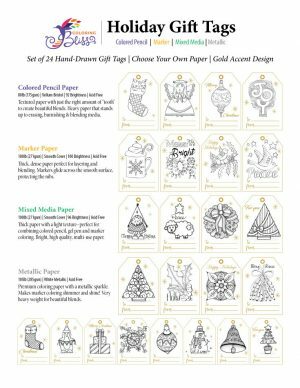 20 Year-Round Holiday Coloring Pages! 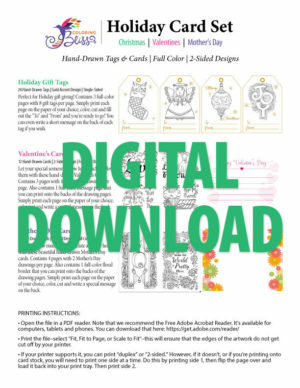 “Holiday Bliss – Volume 2” contains 20 of my coloring pages from major holidays including Valentine’s Day, St. Patrick’s Day, Easter, Mother’s Day, Father’s Day, Halloween, Thanksgiving, Christmas and New Year’s. Plus, for only a couple dollars more you can also add my 10 Page Holiday Gnome Bonus! (10 extra pages of my popular Scandinavian Gnomes.) The book is spiral bound at the top of the page (for right and left handed colorists); and is printed on your choice of my favorite coloring papers. Product Note: the final printed book may not be in the order shown below. Quality paper is awesome. I like the way gel pens, markers and pencils glide softly on the paper. Love, love, your designs are so wonderful for someone who is just starting. You have helped me so much and you make it seem easy. I’m wanting to invest in Greyscale next. Outstanding talent fun and happy pictures to color. takes me to my happy place no matter what time of the year it is. 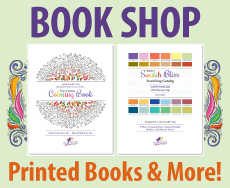 Copyright © 2013–2019 Coloring Bliss, LLC. All Rights Reserved.